All bird lovers want the world to know how smart and special their feathered friends are, and a great way to show off your bird's talents is to teach your bird some cool tricks that will impress anyone who sees them. It can seem difficult to train your pet bird at first, but if you start with the fun and easy tricks outlined below, you'll be surprised at how simple it can be to teach your bird cute tricks that will delight audiences of all ages. Just remember that time, practice, and patience are the keys to your bird's success! The "step-up" command is the most valuable and fundamental command that you can teach your pet and is something that all pet birds should know. Many bird tricks are built upon a parrot's knowledge of the "step-up" command, so it is important to begin any training regimen by teaching your bird this trick first. Not only will it help you teach your bird more impressive maneuvers, but teaching your bird to step-up can also come in handy during vet visits, cage cleaning time, and many other aspects of bird ownership. If you haven't done so already, set aside time to start working on this important command as soon as possible. Once your bird has mastered the "step-up" command, you can move on to teaching him or her a fun and very cute trick -- how to wave hello! 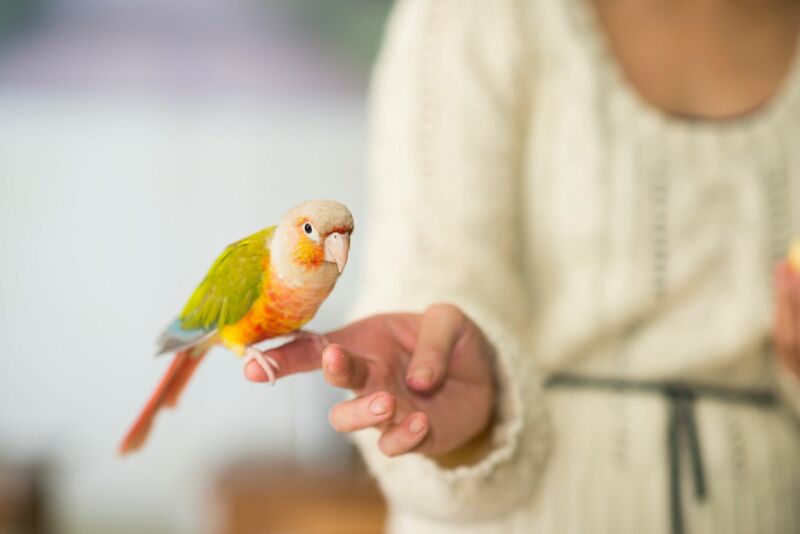 Teaching your bird to wave hello is one of the quickest and easiest tricks that you can teach your pet, and is an adorable behavior for any bird to master. Just keep in mind that making sure your bird knows how to step-up is prerequisite for this trick, and be sure to have plenty of tasty treats nearby so that you can reward your feathered friend for his or her trick training success! One of the oldest and most beloved tricks that for parrots to perform is their ability to learn to speak human words. There are many different methods and techniques that are popular for teaching a parrot how to talk, but a good general rule is that patience and repetition seem to be the most efficient ways to coax parrots into speaking. One thing to keep in mind is that not all parrot species have the ability to mimic words, and of those that do, sometimes individual birds still may not pick up on it. Go into training your bird with a positive and hopeful attitude, and with enough practice, your pet may one day surprise you with an extensive vocabulary. Some people will tell you that it is impossible to "potty train" a bird, and in the biggest sense of the term, it usually is. You can, however, train your bird to reliably use the bathroom on command in a place that you designate, and it's actually a lot easier to do than it may seem. Once you're comfortable holding training sessions with your pet, try some of these bird potty-training methods with your feathered friend. Clicker training is one of the most widely accepted training methods used on animals of all species, types, shapes, and sizes. It utilizes positive reinforcement, which is proven to improve knowledge retention between training sessions and builds upon the concepts of classical conditioning. The really fun part about clicker training a bird is that you can essentially build your own bird tricks from scratch, and then use clicker conditioning to teach your bird to perform any commands that your imagination can come up with. Give it a try with your parrot and see what types of fun and amazing tricks your bird can perform!